Over an evening walk, Ree Drummond plans some fast and healthy meals. She's dreaming of a Heavenly Hummus Wrap, flavorful Ginger Steak Salad, a gorgeous Grilled Nectarine Salad and a Spicy Cauliflower Stir-Fry that's stove to plate in minutes. Ree's keeping it fast and light with her homemade hummus wrap. Ree whips up a fast and flavorful Ginger Steak Salad. 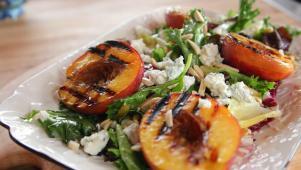 Ree makes a light and delicious salad topped with grilled nectarines.